Our crystal salt comes from the foothills of the Himalayan Mountains and can be used in place of common (toxic) table & cooking salt; to make sole (salt solution), for salt baths, as tea light candle holders and crystal salt lamps. The larger Himalayan salt crystals are hand-crushed to make this holistic, natural salt small enough to be used in a common saltshaker. This salt has all the natural characteristics of the original crystals from which it comes and has a distinctive "alive" taste that's naturally delicious. Slightly pink in color, it contains 84 minerals in a form that can be easily assimilated and metabolized by the body. This salt is truly wholesome and delicious! The salt comes packaged in a 100% cotton bag. Each bag contains 1 kilo or 2lbs. 2.35oz. of salt. Fine granulated salt for cooking and table use, as mentioned in the book "Water & Salt". Benefits include the remineralisation of the body with the over 80 minerals and trace elements essential to health. It also helps to balance the body's pH levels, and can lead to significant positive changes to respiratory, circulatory and nervous system functions amongst others. Made from large crystal stones, which are crushed by hand, the crystals are small enough to be used in a salt shaker. Comes boxed in a linen bag. Fine granulated salt for cooking and table use. Benefits include the remineralisation of the body with the over 80 minerals and trace elements essential to health. It also helps to balance the body's pH levels, and can lead to significant positive changes to respiratory, circulatory and nervous system functions amongst others. Made from large crystal stones, which are crushed by hand, the crystals are small enough to be used in a salt shaker. Packaged in a plastic bag. 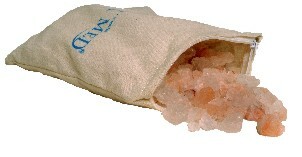 Our coarse granulated Himalayan Crystal Salt is perfect for those who want to use a salt mill or grind their own salt. As with all of our crystal salt products, these smaller crystals originate from large chunks of crystal salt that are extracted by-hand from the mine. The large crystal are then hand-crushed, using wooden and stone tools, then hand-selected to the appropriate size for using in a mill. 100% pure crystal salt. It contains 84 minerals in a form that can be easily assimilated and metabolized by the body. This salt is truly wholesome and delicious! The salt comes packaged in a 100% cotton bag. Each bag contains 1 kilo or 2lbs. 2.35oz. of salt. Coarse granulated salt for use in a salt mill, as mentioned in the book "Water & Salt". Benefits include the remineralisation of the body with the over 80 minerals and trace elements essential to health. It also helps to balance the body's pH levels, and can lead to significant positive changes to respiratory, circulatory and nervous system functions amongst others. Perfect for those who prefer grinding their own salt. Hand-crushed from the larger stones, they are a visual and culinary enhancement to any meal. Comes boxed in a linen bag. Coarse granulated salt for use in a salt mill. Benefits include the remineralisation of the body with the over 80 minerals and trace elements essential to health. It also helps to balance the body's pH levels, and can lead to significant positive changes to respiratory, circulatory and nervous system functions amongst others. Perfect for those who prefer grinding their own salt. Hand-crushed from the larger stones, they are a visual and culinary enhancement to any meal. Packaged in a plastic bag. Perfect for making Sole, the synergistic combination of water and salt that has a higher energetic vibration than either water or salt alone. These crystals are the foundation for many of the therapeutic applications detailed in the book, "Water & Salt, The Essence of Life". Packaged in a plastic bag refill or glass jar. A Himalayan Crystal Salt bath is a sheer ocean of energy for us. Bioenergetic deficits are rebalanced and weak links become strengthened, reactivating our body's electric current. The organs' functions start to resonate with the natural frequency patterns of the salt water (sole). This activates the natural regulatory mechanism of the body and its self-healing powers. The minerals and energies stored in the sole can optimally be absorbed during a full moon. The body's healing potential is at its peak and bioenergetic weak points are harmonized and the body's own energy flow activated. Slip into a sheer ocean of energy with these magical bath salts. Imagine taking a dip in the pristine primal ocean, some 250 million years ago. Now you can. Relax, while your body absorbs the 84 vital nutrients and your skin attains the soft glow of health. Can be used for Moon Rhythm Bathing and for treating skin conditions such as psoriasis. Packaged in a linen bag. The Best Care Vital Sole is a 26% pre-mixed Sole with Original Best Care Himalayan Crystal Salt. Contains 7 vials (25ml each). Take one tea spoon daily first thing every morning with plenty water. Crystal Sole "PELOID" is the natural, mineral-rich, soft, wet earth that accumulates on the floor of the salt mine and recrystallizes. The Crystal Sole mud effectively supports the natural regeneration of the skin. It neutralizes skin impurities, prevents the forming of wrinkles and tightens the upper layer of your skin. Salt Crystal Lamps The lamps are produced mostly by handicraft. No chemical additives are used. Salt crystals emit neutralizing ions, thus improving the climate of a room. A salt crystal lamp will enhance the atmosphere of any room. Salt Crystal Tea Lights These are natural room ionisers, providing a beautiful warm glow to enhance the room's atmosphere. A beautiful gift or treat for yourself. Vital Sole is a 26% pre-mixed Sole with Original Best Care Himalayan Crystal Salt. Contains 7 vials (25ml each). Take one tea spoon daily first thing every morning with plenty water. Book: 'Water & Salt, The Essence of Life'. From the first day that this book was introduced in Germany two years ago, it was an immediate bestseller. Millions of people have changed their lives in respect to water and salt with the profound scientific information presented herein in an easy-to-read format that everyone is able to understand. Critically Acclaimed in Europe... This book started a revolution in natural healing!